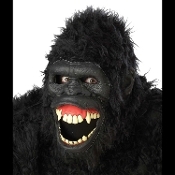 Ani-Motion Deluxe GOIN APE Gorilla King Kong inspired Mask Halloween Cosplay Costume Accessory. Full over the head latex mask with understructure armature built right in. The most unique masks made. Once the mask is placed on the head, chin mounts allow mouth to open, the lips roll back to reveal a large teeth and gums and a very ugly angry look. This is exactly the way it was done in Hollywood Movies back in the day. You have to see it to believe it!